If you’ve ever pounded the pavements in a fancy pair of running shoes, you’ve probably also strapped a mobile phone to yourself to track and record your every movement. And there’s no shortage of apps to help you do just that. 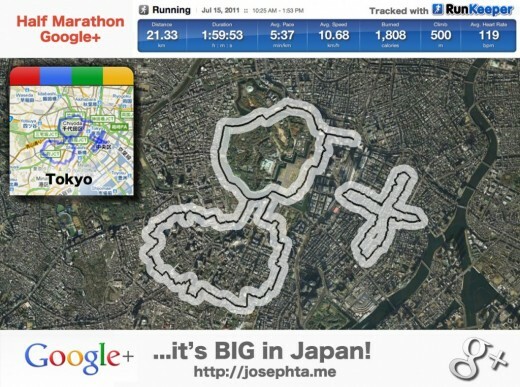 But over the past few years, one Tokyo-based man has taken technology and the art of running to a whole new level. Hailing originally from Orcop, a rural village in Hertfordshire, England, Joseph Tame fell in love with Japan following a backpacking trip in 2001. Having spent a couple of years (unsuccessfully) trying to secure a work visa, he returned to the UK to enroll for a Japanese Studies degree at the University of Sheffield, eventually graduating in 2008. It was there he met his future (Japanese) wife, Satoko, and they upped sticks and relocated to Tokyo in September 2008. 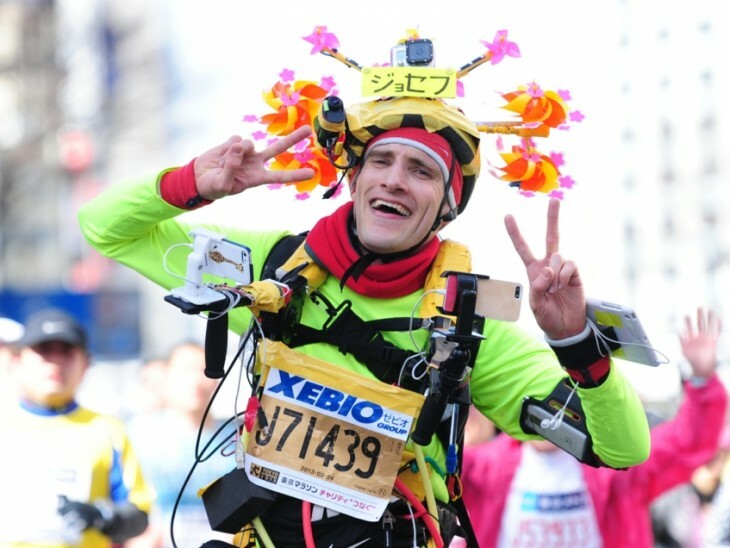 For the past five years, however, Tame has been garnering attention for his peculiar penchant for strapping gadgets to his body and broadcasting his efforts from the Tokyo Marathon to the world. Then there’s his running art, which involves mapping out elaborate routes on Google Maps that resemble well-known ‘things’ – such as company logos or animals. But more on that later. His first foray into organized running was the 2009 Tokyo 10km (a quarter of the full Tokyo Marathon), but he soon progressed to the full shebang, which he has completed every year since 2010. 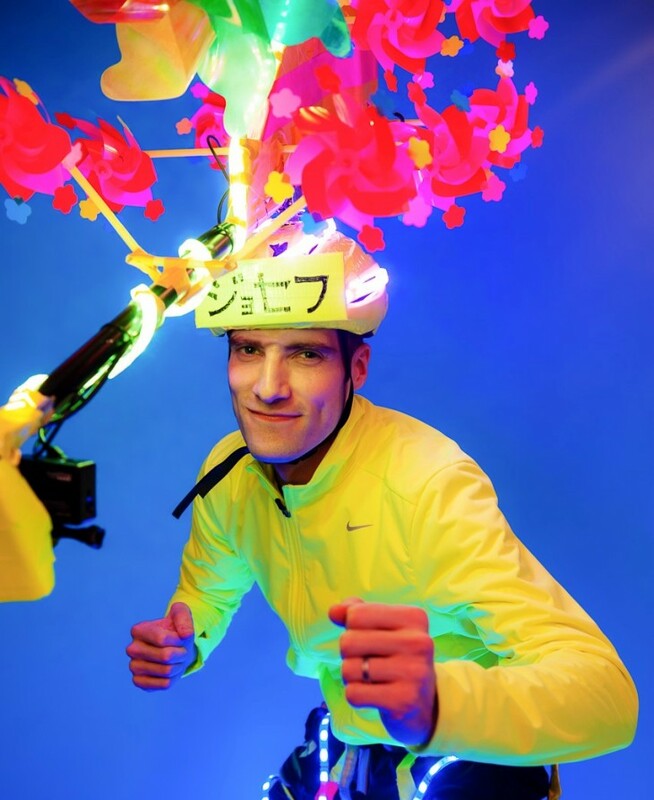 In his inaugural full-marathon year, Tame live-streamed his run from a head-mounted iPhone, grabbing more than 13,000 viewers and attracting north of 1,000 tweets per hour. But in 2011, Tame upped his game, building himself a fairly sophisticated social media studio featuring four iPhones, an iPad, iPod, Android phone, rotatable mounts, 3 WiFi units and a bird-feeding dish. ‘Bonkers’ doesn’t even begin to cover it. His so-called iRun unit was equipped with Twitter, RunKeeper, FaceTime and Skype, and it featured a mini weather-station to stream information about the temperature, CO2, noise and humidity levels. Tame is retuning for his fifth Tokyo Marathon this coming Sunday, and as you’ll see, he’s ramping things up a notch yet again. 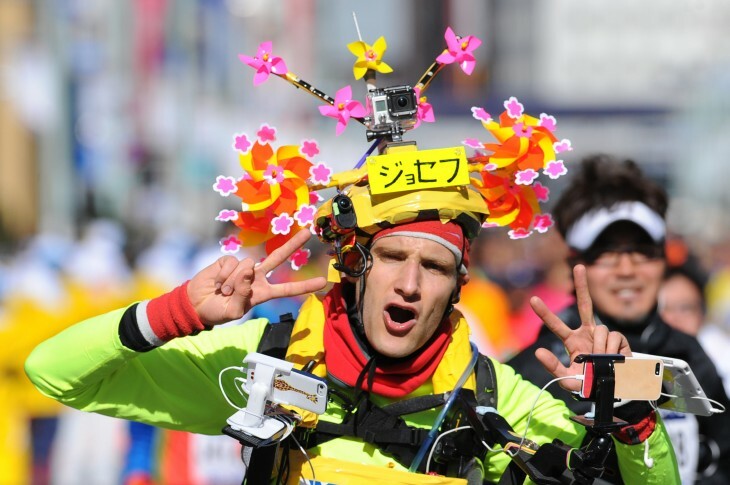 For the 2014 Tokyo Marathon, Joseph Tame will be sporting a wind-powered 360-degree camera that rotates as he runs. Here’s a glimpse of what you can expect. 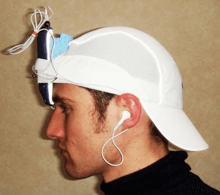 On his 26.2-mile Tokyo traipse, Tame will be sporting the following equipment, which serve as trackers, cameras, power, and back-up devices. 180GB of micro SD cards: Purpose? A lot of content is being captured! Tame has two of these LiveShell devices, covering each camera. One camera is mounted to the end of a 360-degree swivel boom, which is attached to his helmet facing him. The other is fixed on his helmet pointing outwards, but both will stream via HDMI whilst recording to the micro SD cards. Tame will also be carrying a Safecast bGeigie Nano geiger counter, which connects to the iPhone 5. And why on God’s Earth would he need that? “To demonstrate that Tokyo is safe and to promote the important work this non-profit does,” he explains. Fair enough. Throw into the mix six Energizer XP18000A batteries, which provide more than 104,000 mAh of power – “enough to recharge an iPhone about 72 times” – and you can start to imagine how much preparation, planning and expense has gone into this. He’s a one-man film-crew, broadcaster and marathon-runner. So, are Tame’s iRunning exploits just a happy coming together of two hobbies – running and technology? Tame says he was a lover of gadgets long before smartphones and other connected devices arrived on the scene. As a kid he bought and built little DIY radio kits, created elaborate motor-driven mousetraps, and even tried to keep his sister from entering his bedroom by building combination locks from playing cards and kitchen foil. These days, Tame actually uses RunKeeper, which was also one of the earliest trackers in the App Store. But why RunKeeper, over the myriad of other apps out there, such as Runtastic or Strava? This basically enables ‘pocket tracking’, meaning that it can automatically record any walks you do of more than fifteen minutes without opening the app. “RunKeeper’s support for the M7 was a key reason for buying the 5S,” adds Tame. As is the case for most runners, being able to track one’s moves and revisit this data afterwards brought a lot of value to the running experience for Tame. Between Tame’s early technology-powered jaunts and his upcoming 360-degree effort of 2014, a lot has changed in the technological realm. Back in the day, Tame’s mobile phone contract forbade live-streaming apps, which was a bit of a bummer considering he’d decided to enlist the (virtual) support of his friends and family around the world when running the quarter-marathon in 2009. However, one jailbroken iPhone later, Tame installed QIK on his device to live-stream the run – but it wasn’t the most sophisticated of setups. Besides having to jailbreak his phone to use QIK, Skype couldn’t be used over 3G – which was slow and lacked extensive coverage anyway – and battery-life was appalling. Throw into the mix the lack of pocket WiFi, and the general unreliability of the technology that was available, then you can start to imagine how much more tricky things would’ve been back in 2009. “For the first three years, my runs were plagued with power-loss, signal-loss and crashes. It was quite stressful,” continues Tame. Indeed, for the 2014 run, Tame has the luxury of quality live-streaming on all devices, good back-up batteries, fast LTE, and pocket WiFi. Things are definitely looking up. While Tame may be a one-man band, he does get support on the day from his family, who not only cheer him on but monitor the live stream to let him know if there are any problems, such as a camera disconnect or GPS failure. And this year, he will have a team supporting him around the marathon route, carrying spare batteries, food and drink, not to mention providing moral support at predetermined spots around the course. If you find Tame’s iRunning exploits in the Tokyo marathon interesting, quirky or downright bizarre, that’s only part of Joseph’s story. Welcome to the world of running art. Google+ received pretty warm reviews from its early band of users back in 2011, but Tame took his appreciation of the social network to a whole new level by running a half-marathon route mapped out to resemble the Google+ logo. But this wasn’t the first time he’d involved himself in such escapades. 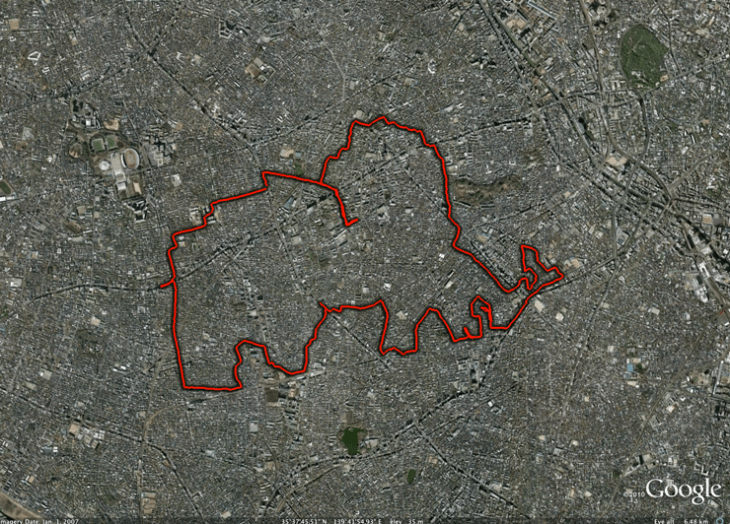 The previous year, Tame had mapped out a route to run that resembled an elephant, which was basically his bid to distract himself from the psychological barriers he faced when running more than 12km. Indeed, rather than doing what most runners do, and plot out the most feasible circuit from home and back again, he creates GPS traces that paint pictures. Can you see the elephant in Google Earth here? “I still recall getting completely lost around the trunk section,” says Tame, who has subsequently gone on to run many different kinds of recognizable entities, including a snowman and a map of Japan. What began as a ‘simple’ boredom-alleviating exercise has blossomed into something mega. 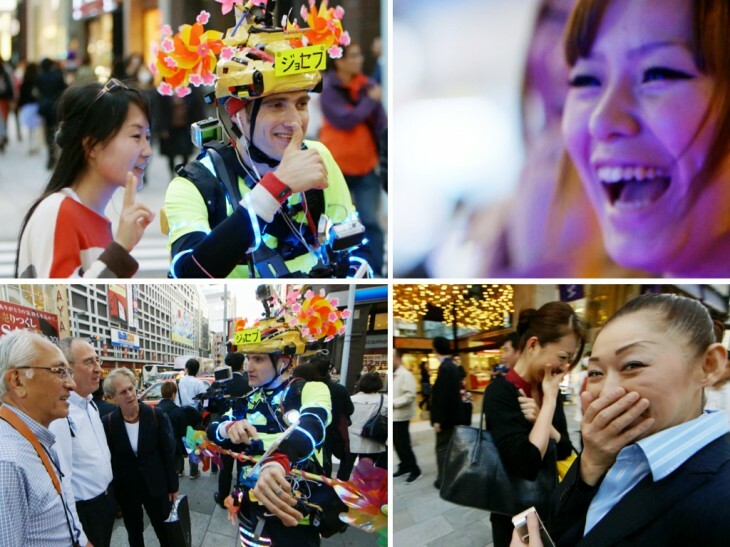 He’s now being commissioned by companies to work his magic out on the streets of Tokyo. In 2012, Tame was approached by creative ad agency W+K, which is known for its big-budget marketing campaigns for major firms. For the launch of Nike’s new running shoes, they wanted to find someone to run 100 meters every time someone ‘Liked’ the Nike Facebook Page. “But that alone wasn’t really enough, because ultimately all that person would be doing was running – it wouldn’t make for a very entertaining campaign,” explained Tame at the time. Tame’s running art shenanigans have yet to materialize into a full-time gig, though Tame says he wouldn’t be averse to that happening. Thus far, Tame has earned enough from this to cover material costs, through projects such as Nike’s Run Like Me campaign. And he’s been paid to appear on TV and radio shows, while you may remember he also showed up at LeWeb in France a few years ago. While it’s clear Tame would love to transform his GPS art into a career, for now he’s still running a small company five days a week, providing digital media services to a number of clients. But the attention garnered from his quirky extracurricular exploits out on the streets has worked wonders for business. “The marketing power of doing something so ridiculous cannot be underestimated,” says Tame. Tame says the most challenging art running project he completed was just last year, in preparation for Tokyo’s 2020 Olympic Games bid. 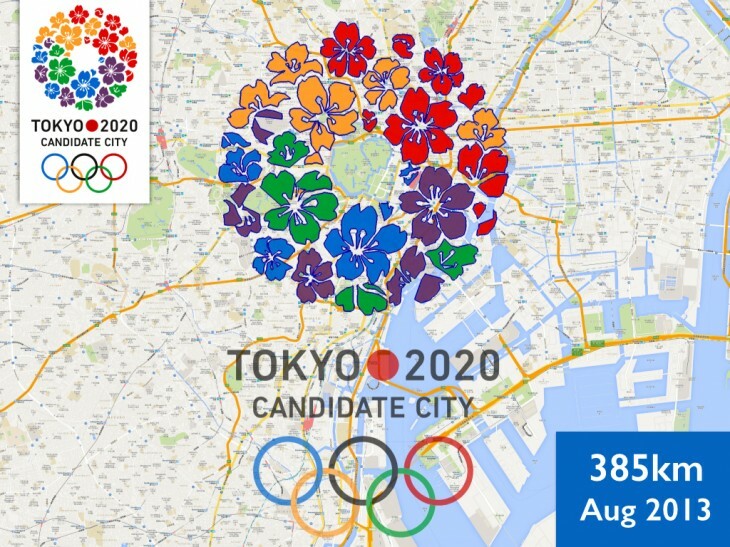 “I like to think that Tokyo got the Olympics just because I did this,” jokes (we think) Tame. Tapping Google Maps, Google Earth, Photoshop and a barrel-load of patience, Tame has painstakingly recreated logos and pictures across a hundred different entities, though he does admit that this is merely an estimate. He has lost count. If you’re sitting there thinking, ‘Heck, I’d like to do something like this’, you can see some of his processes first-hand in this Discovery Channel skit. Tame’s longest non-stop run thus far has been 53km, which was for one segment of his Nike project. And if you’re wondering what kinds of times Tame is notching up for his marathons, well, he says he nabbed a 4h 30m for an ‘unofficial’ personal marathon while doing one of his art pieces. 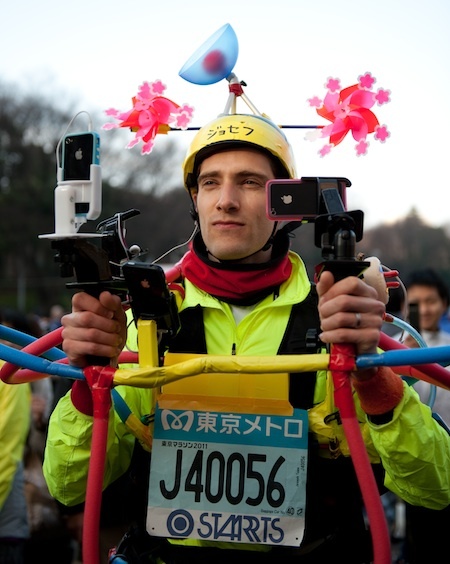 The iRunner managed a 5h 06m in the Tokyo Marathon, and you must remember that was laden with cameras, mics, phones and tablets – so it’s really quite a decent time. Interestingly, Tame tells us that he’s never actually completed a ‘normal’ marathon – one not involving art or live-streaming. Next up for Tame, after the 2014 Tokyo Marathon is lost to the foggy ruins of time, are more LED art projects, which basically involves kitting himself out with a tonne of lights and illuminating his path. He carries out a series of long exposure shots around Tokyo’s landmarks. For this, Tame has got a battery sponsor – which he’s also benefiting from in the upcoming marathon – as batteries are pretty much imperative for LED runs such as this. However, Tame became a father last September, so little Ricky should be taking up more of his time. “He’s just starting to become aware that his dad tends to wear windmills and LEDs,” says Tame. Meanwhile, if you’re looking to follow Tame’s Tokyo Marathon exploits on Sunday, you can do so right here.